In public radio, it goes without saying that the public – our existing audience and otherwise – should be at the heart of everything we do. One way to bring more of those people into our reporting is through social callouts, where we ask the wider world to share their stories, photos and thoughts on any number of topics. NPR has done a variety of these in recent years and we’ve learned a lot about what works and what doesn’t. 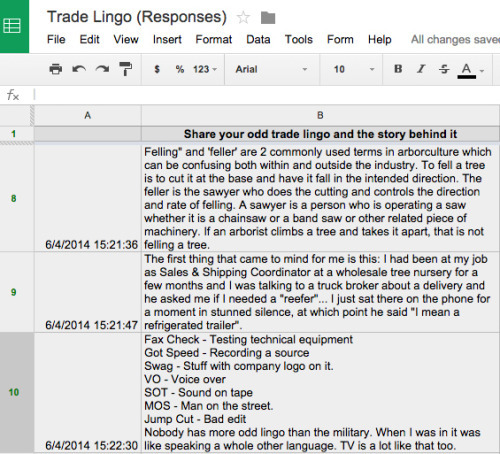 After reviewing some basics, we’ll look at case studies for six different types of callouts. Every callout essentially has six steps. Follow up! If possible, reach back out to all participants, thank them for participating and share the story link. Use this as an opportunity to get them to sign up for a newsletter or take other action. The first step – honing the question – is arguably the most important part. Be specific about what you’re asking for and set it up with context. Provide examples whenever possible so you can get people thinking in the same vein. Be clear about how you’ll use their answers. And consider how the reader will feel in that moment when they’re deciding whether they want to participate. You should also be thinking, early on, about where you’ll share your callout. Yes, you should hit Twitter and Facebook. But you should also think about the niche online communities where your pitch might land particularly well. For this story about a corncob pipe manufacturer, St. Louis Public Radio went looking on the PipeTobacco subreddit for someone who actually smokes with one. When sharing it, don’t be afraid to ask for help. Former NPR producer Davar Ardalan has a go-to list of well-connected people she shares her callouts with when she’s trying to reach different demographic communities, like Latinos and African Americans. The methods for reviewing responses are largely individual. When I’m looking at answers in a spreadsheet, I like to add extra columns that allow me to sort and filter by theme, good answers, etc. Obviously, the same rules we live with for vetting sources in every other part of journalism also apply to social sourcing. It’s easy to get burned if you don’t do approach it with a critical eye and do your homework. When it comes time to write the story, think about how you’ll present the responses differently on air and online. Chances are, the same method won’t work well for both. For an example, compare the audio version of this segment on Thanksgiving grace traditions to the digital story. And although it may take a bit of time, always follow up. Thank everyone for participating and send them a link to the final story. You don’t want people to feel like they’ve poured their heart and soul into a black hole. Read on for case studies of six common callout types. 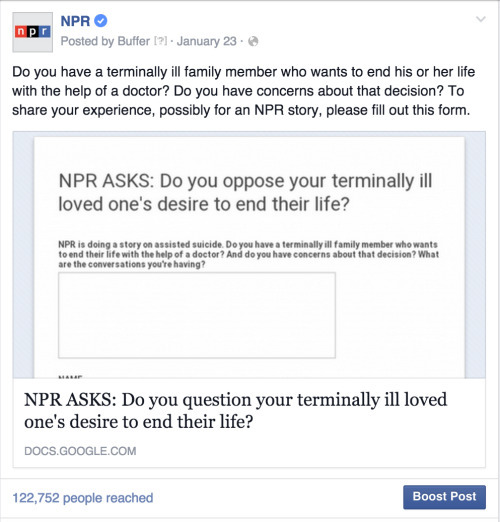 Source callouts are among the most popular and effective callouts we do at NPR. We’re helped by a large following on Facebook (almost 6.1 million as of this writing, updated in 2019). But that can pose a couple of problems, too. Sometimes we do callouts that get over 10,000 responses (as we did for this story) and they’re nearly impossible to parse. And as I mentioned earlier, it’s important to consider sharing callouts with different communities. Going beyond Facebook can improve your chances of finding the voices you need by narrowing your callout to communities specifically interested in the question you’re asking. In one callout, however, it was actually helpful for us to target people who are already NPR fans. Weekend Edition Sunday was looking for someone who opposed a terminally ill family member’s wish for assisted suicide. It’s a fraught and sensitive topic and it’s not surprising that the show’s producers didn’t get an overwhelming number of responses when they posted it to Facebook. But the show did get exactly what they needed. Scott Schwimmer wrote in about his father, Robert, who has pancreatic cancer. Because the family loved NPR, they agreed to come into a studio together for an interview with Rachel Martin. The result is really must-listen radio. Photo callouts can work really well online. They can also turn into good radio segments with a little extra work. 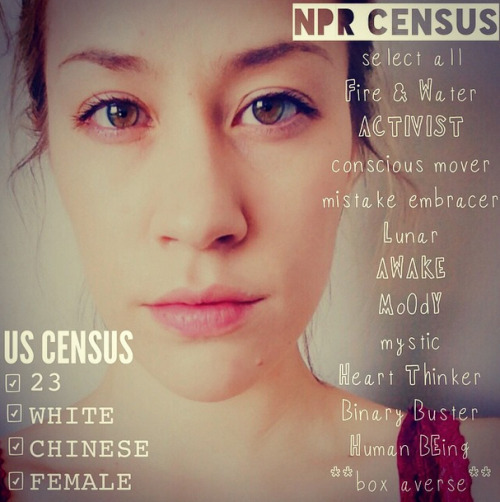 We had that experience with the #nprcensus callout for the New Boom series on millennials. Because millennials are such a large and diverse group, we wanted to incorporate a social project that helped give them a face. All Things Considered producer Selena Simmons-Duffin had the idea for a “census” where we asked 18- to 34-year-olds to send us a selfie with their demographic categories on one side and the descriptive categories they wish they could use on the other. We received hundreds of responses through Instagram and Twitter. To tie it all back to the radio, I interviewed a couple of them about their varied millennial experiences for a segment to wind down the series on All Things Considered. Sometimes finding story ideas can be as easy as just asking your audience: What should we cover? 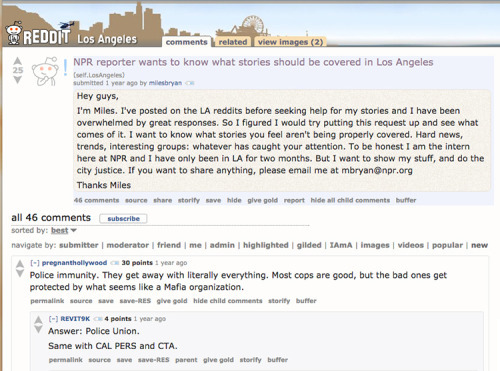 Former NPR intern (and now WBEZ reporter) Miles Bryan did just that in the Los Angeles subreddit. He received a number of interesting responses and ended up pursuing a lead that led to a story about the waiter call systems in Korean barbecue restaurants. When doing something like this in reddit, it’s a good idea to message the moderators of the subreddit beforehand. Having their buy-in will go a long way toward having a successful callout. Otherwise reddit tends to be allergic to anything it perceives as self-promotion. Though counterintuitive, callouts sometimes work well when you don’t know what you’re looking for. That was the case for a series Melissa Block did on trade lingo. She wanted to talk to folks across professions and industries about the weird words or phrases they use at work that outsiders might not understand. The nature of the callout meant that producers had no idea what words they might get. So they put out a call using a Google Form (a survey that feeds into the spreadsheet you see below) that was shared on Facebook and Twitter. The response was excellent. They heard from all sorts of people, including seabird biologists, skydivers and video game designers. A callout can also be a way to start an open discussion with the audience that informs the direction of your reporting, as well as find sources. NPR’s Identity and Culture Unit used a callout like this for conversations led by Michel Martin about the fear of black men. There are a couple of things to note about this callout. 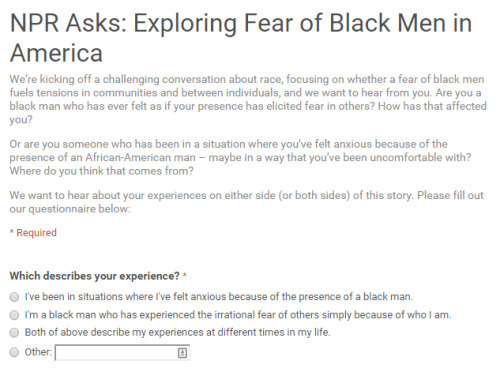 In the survey, producers had respondents drop themselves into different categories (“I’ve been in situations where I’ve felt anxious because of the presence of black men”; “I’m a black man who has experienced the irrational fear of others simply because of who I am”; etc.). That made sorting the responses much easier. Producers also allowed people to share their thoughts but request to not be contacted. This option likely helped them acquire a wider array of experiences. And you may want to do a callout just for the sake of having fun with your audience. 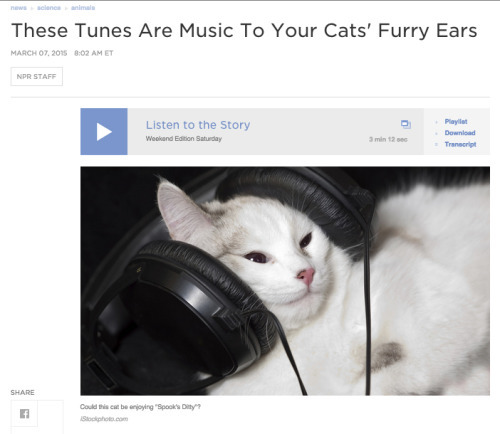 That was the case with this story Weekend Edition did about music designed specifically for cats. Producer Sarah Handel Card asked listeners to play the music for their pets and report back (spoiler alert: reactions ranged from manic to unmoved). A version of this post originally appeared on NPR’s Social Media Desk Tumblr. It was also presented as a webinar in April 2015. This post was updated in February 2019 by Amy Morgan, Senior Engagement Editor for Digital Content, and Malaka Gharib, writer and editor for NPR’s global health and development desk.